TheGunBlog.ca — The Canadian government will consider new proposals early next year to criminalize sport shooters who keep their handguns at home and to make it easier for police to confiscate any guns, the Toronto Star reported, citing an unidentified government official. The government is studying the policies to stop rising gang violence and crime, suggesting its existing multi-billion-dollar system to track lawful shooters and their handguns has failed. The government is exploring several proposals as part of a package that may include mandatory handgun storage at Canada’s 1,400 shooting ranges instead of a ban being examined on a million handguns, the Star said on its website last night, citing an anonymous senior government official. The policies are being drafted for presentation to cabinet early next year, the newspaper reported. A final decision on a handgun ban hasn’t been made, the Star said. Costs. High cost to build, manage and guard. Casualties. The nighttime security guard will have a short life expectancy. Cancellations. Shooters are already cancelling or postponing new firearm purchases because of legislative uncertainty. Thank you for your coverage. Millions of shooters/hunters across Canada are watching. Central storage = dream-come-true for gangs. Prime Minister Justin Trudeau won the last election after promising to make it harder for hunters and sport shooters to buy, sell, transport and use firearms. A public-relations firm that advises the government has said new restrictions present an “untapped opportunity” for Trudeau and his Liberal Party to win even more votes in next year’s election. All the measures proposed this year, including Bill C-71 and the possible handgun ban, would invent new crimes for Canada’s 2.2 million men and women with a federal firearm licence. Millions more family and friends of all ages also shoot without a permit under their supervision. The Toronto Star said new regulations could allow police to suspend a person’s licence without a criminal charge or conviction if they deem it justified for safety. That would simplify seizures because all guns are banned for everyone under threat of prison unless they have a permit authorized by the police. No licence, no guns. The government is moving away from the idea of a direct handgun ban after estimating it would cost $1.5 billion to $2 billion in taxes to buy the roughly 1 million pistols and revolvers that Canadians have registered with the police, the Star said. The government estimated people own twice that number of unregistered handguns, the newspaper reported. The Star cited a second Liberal as suggesting new restrictions on firearm storage, transportation and transfers are more likely than new bans. All the new plans indicate the current licensing and registration system invented by the Liberals has failed to stop violent individuals and gangs, while violating the privacy and property rights of millions of honest Canadians and costing taxpayers billions of dollars. Hunting and shooting are among Canada’s safest and most-popular outdoor and sporting activities. More adults have a gun licence than play golf, hockey, tennis or who ski. 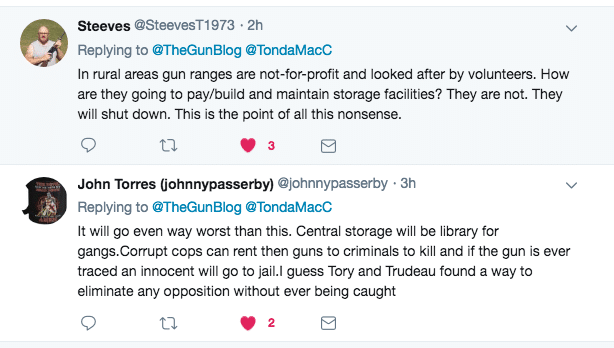 Central storage repositories, an idea requested by Toronto Mayor John Tory, would be a dream-come-true for a government seeking an easy way to seize guns and for gangs wanting to steal thousands of weapons from a single location. 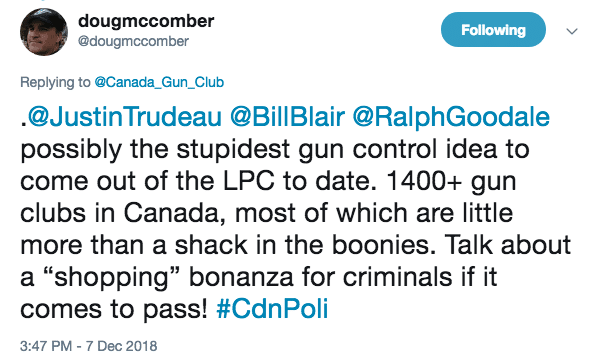 “Home handgun storage ban = central storage facility = one-stop shopping for criminals and future one-stop governmental confiscation of all firearms at their convenience,” Chris MacLeod told TheGunBlog.ca. The Canadian military and police, who keep their firearms at bases and stations, have had more than a thousand weapons lost or stolen in the past 13 years, Dennis Young reported last week, citing data obtained through laws on access to information. 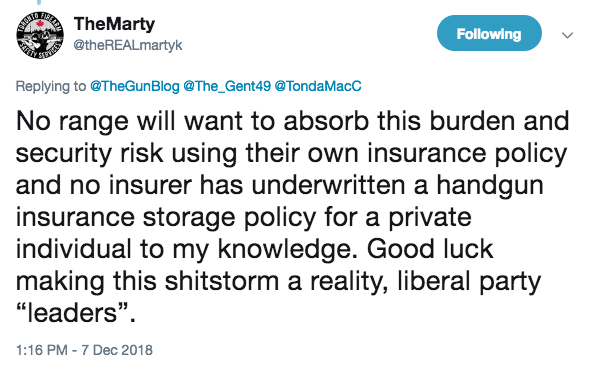 “No range will want to absorb this burden and security risk using their own insurance policy and no insurer has underwritten a handgun insurance storage policy for a private individual to my knowledge,” Marty Kerluck, a firearm-safety instructor and former board member of the Toronto Revolver Club, said on Twitter. The club operates out of the last private shooting range in Toronto. Canada had 292,701 men and women who owned 861,850 pistols and revolvers at Sept. 30, the Toronto Star said, citing the federal police. Businesses and museums own another 125,000 or so. The police decide who is allowed to have guns for hunting, plinking, recreation or competition through the Canadian Firearms Program. Barring two exceptions, private individuals aren’t allowed to buy handguns for personal protection. The Ministry of Public Safety, which manages firearm policy, didn’t respond to a request from TheGunBlog.ca for comment on the new measures it’s considering.